Note: This article was originally published by Pure Powder - the off piste and heli skiing specialists - on www.PurePowder.com in June 2010. Permission to reprint this article was obtained from Pure Powder. You wake up, look out of the window, and there's a pristine blanket of fresh white snow covering everything in sight. To make the most of those unforgettable powder days, here are some top tips to help improve your off piste skiing techniques - pulled together with the help of one of CMH Heli-skiing most experienced guides, Roko Koell. Rhythmic up-and-down motions are the key to skiing powder. Begin with the ankles, knees and hips comfortably compact. Then extend upward, gradually flexing and extending the ankles, knees and hips, but stopping before the body is fully erect. Create a consistent up-and-down rhythm while moving only within this range, always keeping your hands forward. If you stand up too tall your body will hang back whilst your skis accelerate forward - causing the infamous backward lean and resultant burning thigh muscles. Top tip: the more equal both skis are weighted, the easier it is to maintain balance and to link turns together harmoniously; the first turn is the most important turn, as it helps set your rhythm right; concentrating on proper pole plants will help you to maintain you rhythm and link your turns together. When skiing in the powder you need to exaggerate your movements, ski with longer turning movements and feel the sensation of skiing in slow motion. Patience and persistence are crucial factors when turning in deep snow. You need to push your feet gradually and continually against the snow in order to complete each turn. If you give up on your turning movement too soon, your skis will accelerate and run away from underneath you, resulting in an incomplete turn, the dreaded backward lean, and loss of control. Top tip: to make nice round turns in the powder, count slowly to yourself "One, two, turn. "; be patient when beginning the turn and assertive when completing it. Resist the urge to force your turns to happen too soon, as this causes you to over-rotate. This "up-floating" speed promotes turning and balance (equal weighting over both skis) and allows you to get a rhythm going. Top tip: until the appropriate speed is established with confidence, all effort and exercise is hard work and physically exhausting - don't despair, have the confidence to get your speed up; think about skiing with a guide or instructor for a couple of hours to help build your confidence up and pull you out of your comfort zone. Roko Koell is a CMH guide and founded CMH's Powder Introduction programme. Roko is a fully qualified U.I.A.G.M Mountain and Ski Guide, Level 4 Ski Instructor and Ski Racing Coach. Moguls are one of those challenges in skiing that can strike fear into all but the most expert of skiers. The thing is, moguls can be our friends. Yes really, they can! If you are comfortable skiing down groomed slopes at varying gradients then you will have the ability to ski a mogul field. I’m not necessarily talking about high speed ‘ripping’ directly down the fall-line or performing aerial manoeuvres like the pros. But it is achievable to ski smoothly and graciously down through a mogul field performing short radius turns like you might on your favourite groomed run. Skiing is all about adapting to the terrain that we are on at the time. When we drive a car we adapt to the type of road we are using. For example, on a small winding road you would drive more slowly, probably in a lower gear, than on a straight major highway. Many skiers become locked into a certain way of skiing which works fine on certain terrain, usually groomed runs, because that’s what we mostly do. But transfer that technique to other terrain, like moguls or powder, and it might not work as well. I’m not saying you have to change the way you have learnt to ski, just make some tweaks which help the skis deal with what’s in front of them. Modern ski technology has enabled skiers to ‘carve’ out smooth turns on groomed runs with relative ease. This is great news because carving out high speed turns can be great fun. But, without going to much into technical detail here, what we are doing in these turns is basically pressurising the inside edge of the turning ski and letting the ski do the work. I have seen many good skiers head into the moguls and continue to apply the same technique. What tends to happen is that very quickly they gain speed and cannot handle the impact of the moguls. They quickly get thrown backwards even though they understand the principles of flexion and extension crucial to skiing moguls. For me, the simple solution to skiing moguls at any level is ‘rotation’. This means that we separate the lower part of the body from the upper part. Our legs work independently from out torso. We are steering the skis with our legs and feet. We still use our edges and we still pressure the skis, but in a different cycle. One of the best ways to improve our rotational skills is to practice side slipping. It’s not an exiting prospect I know, but a little bit of training here and there will pay off in the long run. Side slipping involves keeping the skis perpendicular to the slope and sliding down at a controlled speed. It is often something taught to beginners as a safety mechanism to get down steeper slopes. In reality, it is a tricky skill to master but teaches us a lot about edge control and rotation. The key to this is to pick a fairly steep slope on a groomed run. First, practice your side slip facing one way, then stop and turn around 180 degrees and practice facing in the opposite direction. Start in a stationary position with the skis at right angles to the slope and about hip width apart. Ensure that your skis are angles so that the inside edge of the lower ski and the uphill edge of the upper ski are holding you in position. Then slowly release both edges simultaneously until the ski flattens against the snow completely and then control your speed by applying more edge as required. More edge means less speed. The key here, and this is really important, is to make sure you don’t ‘drift’ from the fall-line. In other words you must side slip in a perfectly straight line down the slope. Build up your side slipping practice and then start to change your direction from facing one way to the other as you are moving. This involves releasing the edges and fully rotating the skis 180 degrees underneath your upper body. Again the key here is to keep side slipping in a straight line down the hill, even when changing direction. Do ten to fifteen minutes of this a day and within a week you will see a big improvement. Hey, get a bunch of people together and go to a slope with a short tow lift. Take your ski poles and mark out a straight line course down the hill by laying 2 sets of poles about 4 meters apart. Practice your side slipping and stay within the channel of poles. Make the channel narrower as you improve! What’s this got to do with skiing moguls!! Well, become a master of rotation and all those tips about skiing on top of the bumps and flexing and extending will all become much much easier to perform. Robert Stewart is an ISIA certified ski instructor who has over 20 years of teaching experience with all levels of skiers. He was formerly a professional freestyle skier and competed in freestyle competitions across the globe. 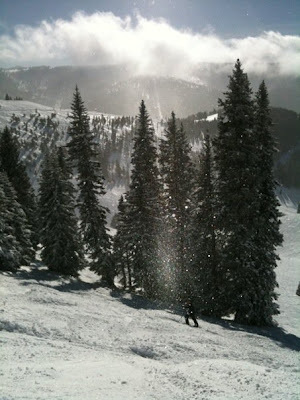 You can find out more about Rob on his own skiing blog at http://blog.themountaindepartment.com. So here you are, trying to feel like a young maverick skier going off the trails and into the trees - just hoping that someone passing overhead on the charlift will spot you and give out a loud "WHOOT" of approval and impressiveness (is that a word?). And then, just before you are about to follow your all too expert friend off the side of a cliff with thick forests of trees that look like they could swallow you whole, you realize, "Wait, how the (insert favorite four-letter word here) am I supposed to do this?" Fear not. I have your advice right here. The most basic and primary thing you want to do when skiing the trees is simple - look for the empty spaces. As you have indubitably heard (nice vocabulary, right?) if you have taken a lesson with me is the idea of steering with your eyes. That is, your body will naturally follow and move in the direction you are looking. Have you ever been on the sidewalk, walking along and staring at the beautiful models...uhm...necklaces in the store windows? Next thing you know, you started walking off your line and drifting towards that direction. The same thing occurs in skiing. Whenever you look to the right, your body starts to turn to the right subconciously. Now let's apply this to skiing in the trees. Let's say you are coming down to a large and intimidating 100 year old tree. You obviously want to ski around the tree - it is rather difficult to ski through it at this point in time - maybe in another 200 years. So, to ski around the tree, we are going to look around the tree. That's right - do not stare directly at it. Remember what we just said. You go where you look. So look for the spaces. Once you get this idea down, tree skiing becomes almost like mogul skiing. You have to pick your line, look ahead, and plan out your turns. - The one thing about tree runs is that snow groomers cannot fit in the runs to groom the slopes. There also is rarely man-made snow here. Therefore, due to relying on natural snow and uncertain conditions, you never really know how deep the glade snow is or what is underneath. Look out for rocks, tree branches, large tree branches, and any exposed ground surface. Your skis are made to go on snow, not dirt. - When first starting to ski glades, start out on ones that are not as thickly forested or not as extreme terrain. It is better to get comfortable on the easier glades before you move onto the ones with very narrow, untracked, powdery trails with 6 foot (2 meter) jumps. Otherwise, you will hate glade skiing forever. - Since you never know what you may get into, always wear a helmet. This is pretty self-explanatory, but some people will still resist. If you bite an edge on the groomers, you fall and hit the snow. If you bite an edge in the glades, you fall and hit a tree. Be smart, stay smart, wear a helmet. - A lot of times tree runs will not be marked well on a map, or you may get off track due to the lack of a clear cut trail. Always know where you are going and have a general sense of where you are in relation to the major trails around you on the mountain. - Always ski with a partner in the glades. Stick together. It is a scary feeling to know that your friend is stuck in the woods and you have no idea where they are. Be smart, don't ski apart. When you get comfortable, glade skiing can be the most fun type of skiing you will ever do. I did my fair share at Vail and Beaver Creek this past January. They have some awesome, awesome runs that I would recommend if you are seeking out the trees. Now get out there and do it (with my picture as inspiration, of course).